EMO Marine Technologies solutions are based on collaboration. We work within our client’s specifications, request guidance, and provide a final product that is a result of a mutual effort between EMO Marine’s expertise and the experience of our clients. The company’s core technology uses a range of fibre-optic video / data multiplexers and media converters specifically designed, tested, and proven for use in all marine and subsea applications. EMO Marine distinct products are the smallest form factor pressure rated housings in the market. EMO Marine’s engineering capabilities and experience allow the company to supply customised solutions for a wide variety of subsea applications. The systems convert and compress multiple channels of video, high-definition video, Ethernet and serial data into a single fibre-optic transmission. A typical umbilical that is used with a remotely operated vehicles (ROVs) can be very heavy and large in diameter due to the sheer amount of copper wiring required for power, data, and video transmission. Managing the weight and diameter of these fibre-less umbilicals add cost to the overall operation of a ROV. Other drawbacks include the inability to transfer large amounts of video and data over the usual cables is inhibited, as well as the distance these data types are traveling. Using a fibre-optic Mux system will enable you to convert, compress, combine video and data signals to a one fibre-optic transmission. The fibre line itself is smaller than 1mm in diameter and can be found in cabling used in ROV systems. This reduction in cabling dramatically decreases the diameter and weight that significantly factors both in and out of the water. Reducing a tether size reduces the ROV system as a whole saving on time and cost in mobilizing an ROV for subsea operations. EMO Marine’s Mini-T line of video data multiplexer (MUX) systems features 4in-diameter, 12in-long housing which initially was the smallest subsea MUX on the market. EMO Marine has recently introduced a smaller form-factor NANO MUX a 2.5in diameter, 7in long improving our goal to reduce size and weight for those operators with smaller inspection and work-class ROVs. The Mini-T series allows ROVs to upgrade to the latest communications technology with a minimal effort to upgrade and enhance a vehicles capability. A ROV can carry a payload of devices that can include High-Definition cameras, echo-sounders, multi-beam, and side-scan sonar systems for operations ranging from survey work to oceanographic data collection. EMO Marine’s fibre-optic multiplexers are designed to handle all types of communication protocols from these devices and convert them over to fibre for transmission. Our system is comprised of two parts, a subsea housing (Remote) mux and a topside rack (Console) demux. One end to convert to fibre and the other end to break each of the channels back out again so the video and data can be collected and displayed in the operator’s cabin. The Mini-T line of MUX hardware is suitable for all types of ROVs but generally aimed at small to mid-sized working and inspection-class vehicles. Our success in the beginning has been with the older models ROVs that run on copper wiring with limited data bandwidth and our solution enables those operators to upgrade to the latest payload devices without the need to buy a new vehicle or completely overhaul a vehicle’s telemetry system to add a limited number of channels. Our goal is to support manufacturers of mid-sized ROVs who are receptive to the concept of the Mini-T line and consider it for future builds / designs. 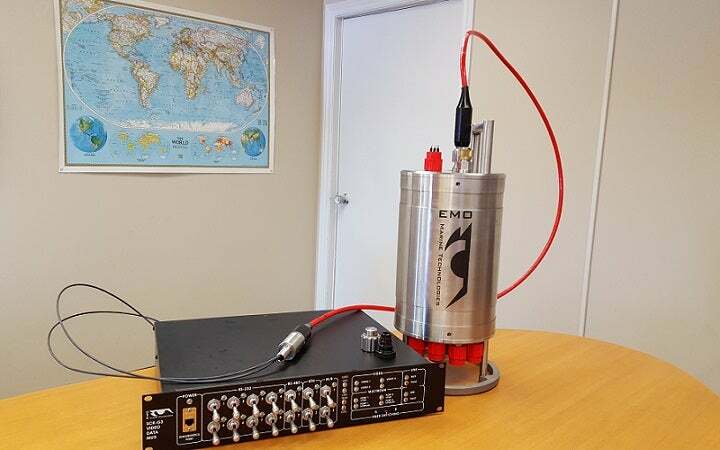 EMO Marine Technologies, based in Nova Scotia, has successfully delivered a Mini-T High Definition MUX system upgrade for a Schmidt Ocean Institute ROV. EMO Marine Technologies specialises in fibre-optic communication solutions for subsea operations, offering a wide range of multiplexers (MUX) and telemetry systems. EMO Marine Technologies, based in Eastern Passage, has been awarded contract to design and build the communication system that will bring data ashore over a fibre-optic cable. EMO Marine Technologies has successfully developed and delivered a custom fibre-optic multiplexer (MUX) system for Sub C Imaging. EMO Marine Technologies has successfully developed and delivered the world's smallest underwater microscope for 4Deep Inwater Imaging, of Halifax NS.